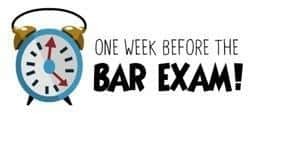 The Bar Exam is a Week Away! We’re certain that you don’t need us to tell you that the bar exam is just a week away. It’s probably something that you’re very aware of almost every hour of the day. You’ve probably started having the “OH NO, I OVERSLEPT AND MISSED THE BAR EXAM” nightmares. Trust us, you’ve got this. You’re not going to oversleep, you’re not going to drop your laptop into a giant puddle, and you’re not going to accidentally smuggle your notes into the exam room and get banned from taking the test. Last week we gave you some tips on what to do the two weeks before the test. So how does that differ from a week before the exam or even a day before the exam? For one thing, you’ve probably memorized any of the areas of law that were giving you trouble. You’ve probably cycled through at least two panicky moments. We’re here to tell you, if you’ve really been studying for the exam, then you will be perfectly fine. Have a study schedule for the final week. Continue your review of the MBE and essay subjects. Continue doing practice questions and reviewing essay questions and analyses. Study multiple areas of the law you struggle with, but don’t get bogged down on any one topic. In other words, don’t spend six days figuring out the Rule Against Perpetuities. The truth is, hardly anybody understands it! Just move on and get the low lying fruit. Set aside time to recharge by taking breaks. Go watch a movie. Take a walk. Pet your dog. Set aside time to create a logistics plan for the test. Think about what you will need to bring and eat, where you will be staying, when you will leave for the exam, and how you will get to the testing site. Hopefully you have all of this figured out already, but make a game plan and stick to it. Switching it all up the day or two before the exam is not a great idea. Get sufficient sleep, but don’t hibernate. You are going to have to get up early on the test days, after all. Eat brain food. Try not to sustain yourself off of sodas and coffee. Go get a nice dinner somewhere. Please just step away from the coffee slowly. Good luck to everyone taking the bar exam next week from all of us at AmeriBar! Where should you work after law school graduation? Graduation is up around the bend for most 3Ls. There’s a good chance that some of you knew what you wanted to do after graduation before you even entered your 2L year. As you go to classes and learn about new options, your preference may change. You’re probably asking yourself, “What makes AmeriBar qualified to tell me about jobs?” We hail from a variety of legal backgrounds. In fact, we could go into excruciating detail about each one, but for brevity’s sake, it’s only as extensive as we’ve written below. We understand that each of you will have different goals for your post-graduation journey. Some people want to pull down a six-figure salary and others want to be able to go home and spend time with their kids. “Best” is completely subjective, so we’ve broken it down into different goals. Naturally, there is going to be some overlap with the jobs, so you may see a few of them more than once. If you want to make a lot of money. According to the U.S. News & World Report, the median salary for attorneys was $114,300 in 2013. It also reports that the salaries can go as high as $187,199 and as low as $55,170. Your best bet for getting a higher paying job is to land a job as in-house counsel for a large corporation or as a trial lawyer in a big firm in a large city like San Jose, CA; San Francisco, CA; or NYC. You’re probably not going to pull a large salary in a rural city or working in public interest. Keep in mind that you’re going to have to work a lot to pull in a big salary. Many firms have billable hour requirements–you’re going to have to really work for that $100K job. If you break it down hourly, then it’s not all rainbows and butterflies. Sing with me now, “Heal the world. Make it a better place. For you and for me and the entire human race…” If you want to make this world a better place for you…and for me…okay, okay, you get it, then you might consider a career in the public interest realm such as a job as a Public Defender or District Attorney. Granted, your salary isn’t going to be $100K, and you may have a ton of thankless clients. Ultimately, though, you will be making somewhat of a difference out there in that big, bad world. Another option is to go into human rights law or environmental law. That’s not to say you can’t make a difference in the corporate world, but any job is going to be as fulfilling and meaningful as you make it. If you want to be your own boss. Hang your shingle! There’s a lot of apprehension about going out on your own, but never fear–someone does it every day. If you do your research, you’ll see a lot of advice against going out on your own because of the salary concerns and lacking client base and experience. It can be done, however, despite the naysayers. You will have to be tenacious and not mind developing your own client base. You’re going to have to work your network like crazy, so that’s why it is important to start working on it from your 1L year if you have any inclination that you want to go out on your own. If you want to get a lot of practice. You’re going to get a ton of experience as a judge’s clerk or in the public interest realm. Many judges cover different areas of law, and you’ll learn how to handle each of these procedurally. If you go into public interest law, you will have no shortage of clients. You will likely cover a specific area of law and work your way up to higher crimes as you get experience, but you will get experience. If you want to be able to go home for dinner. You’re probably not going to want to go into corporate law or work as an attorney in a big firm that requires a large amount of billable hours. You might try becoming a legal professor. The salary is pretty decent, and you’ll generally work a normal 40-hour work week. You’ll have your office hours, plan your lessons, and teach bright young minds of those like yourself. You can also do some of the alternative career paths that have a stable work schedule and hours. If you want to go to court. This will be applicable to many attorney positions, but try to avoid areas of law that generally settle before going to court. Again, you’ll get a ton of courtroom experience if you work in public interest. Another good bet is to look into a law firm that handles a lot of court cases and see if they’re looking to hire an associate. You’ll probably get a lot of courtroom time as a criminal defense attorney in either the private or public sector. If you want to see court from the flip side, you’ll make a lot of courtroom visits as a judge’s clerk, but not from a practicing standpoint. If you don’t want to practice. If you look for alternative careers for lawyers, you’re going to find a TON of information. You can always be a professor. This is an especially great career for someone who wants set hours and enjoys legal research and writing. If you like a good challenge, you could always be a legal recruiter. There’s also the possibility of going into the corporate world, not as in-house counsel, but as the HR director, CEO, or COO. If you have a question or issue that you would like for us to address, send us an email at support@ameribar.com. Your question may be featured on our blog. AmeriBar, the nation’s second oldest national bar review course provider, announces the launch of a bar review course for the Massachusetts bar exam. The course will begin with the July 2018 exam. With the addition of Massachusetts, AmeriBar now offers courses for 42 jurisdictions. Information on AmeriBar’s new Massachusetts bar review course is available here. The MPRE tests many legal concepts. Some rules are tested repeatedly. Here is a video detailing five questions you’ll likely encounter on the MPRE. The National Conference of Bar Examiners announced that the format of the MBE will change starting on the February 2017 bar exam. Although the number of total questions (200) will not change, the number of experimental questions will increase from 10 to 25. This means that 175 questions will count towards your score. Waiting for your bar results is, unfortunately, the nature of the beast. While some of you may only be waiting four weeks (North Carolina), some of you are going to be in it for the long haul of 13 or 14 weeks (Georgia and Texas respectively). 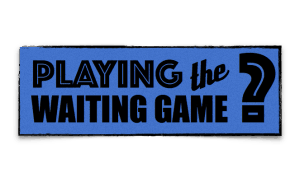 So how do you keep your sanity intact while you’re waiting? You know when your results will be released. They are going to let you know whether you passed or not. So fretting and obsessing over your score is not going to improve your anxiety. Of course you’re going to be acutely aware of the date, but try to relax if possible. Your answers have been submitted at this point, and no amount of stressing is going to change them. You’ve been running the marathon that is bar preparation and exam taking for the last eight weeks, so give yourself a moment to relax. If you’re able, take a mini-vacation. Go hang out with your friends. They’ve probably forgotten what you look like at this point. And, please, go visit your grandmother. She’s worried about you. You’ve been too preoccupied with the bar exam for the last two or so months to be diligent on the job search. A good place to start looking is your law school’s Symplicity page, but don’t discount looking on Indeed or your state’s job posting board. If you have real-world connections, contact them for job opportunities. This goes without saying, but make sure you make an appointment and dress nicely before you pop into someone’s office. I can see you now. You’re walking out of a dimly lit cave while shielding your eyes. “What? What is this? THE SUN?” Yes, it’s out there. In fact, it’s been out there the last two months of your life, but you probably forgot about it while you were holed up in a study room. Resume life as normal. Seriously, don’t do it. So what if you got a question wrong? If it’s an essay question, your final answer isn’t as important as how you reached your conclusion anyway. And if it’s a multiple-choice question, forget about it. Really. There’s absolutely no way that you remember the entire fact pattern and answer choices verbatim. You’re just going to work yourself into a tizzy. Keep the books closed while you’re waiting. One of you probably doesn’t remember the fact pattern or your precise conclusion. Besides, the answers are being graded at this very moment, and there’s absolutely nothing you can do about it now. So take (some?) solace in that fact. You probably did. What if you didn’t? Good news. There’s another exam coming up in July. Really, don’t stress about it. You probably did great. If you weren’t successful, it isn’t the end of days. AmeriBar has programs that can help you pass and tutors who have helped many repeat takers successfully pass the exam. If you have a question that you would like addressed, send us an email at support@ameribar.com.